Fine Jewelry appraisers serving the Portland Metro area since 1992. With close parking and easy access by bus or Max lines. any information from this site. 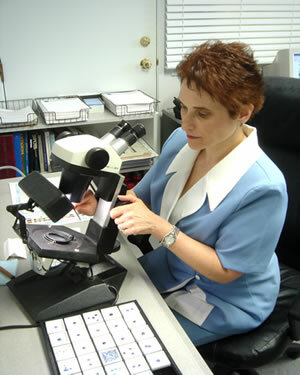 Owner Teresa Torguson is a GIA Graduate Gemologist and an Alumni Member. Teresa has worked in the Jewelry industry since 1980. When Teresa realized that the Portland jewelry industry needed another independent gem lab, Teresa seized the opportunity and opened Accurate Gem Labs, Inc. Teresa is a Candidate Member of the American Society of Appraisers. Teresa has also passed their Ethics, Uniform Standards and Procedures of Appraisal Practices (USPAP), and Gems and Jewelry 201 - 202 exams. To ensure complete customer satisfaction, Teresa is a member of the Better Business Bureau. Accurate Gem Labs, Inc. provides on site appraising. You may be present during the examination procedure. With each appraisal your jewelry piece will be carefully cleaned and inspected. The Gemologist will examine your piece with special instruments to determine carat weight, clarity, color rating and cut quality, value of the metals and workmanship. (Stones do not need to be removed from mounting for examination). Each of these details is researched; and adds up to a monetary value or Retail Replacement Value. Your unique appraisal document will be carefully prepared for you and your insurance company. A detailed, professionally written document with photographs will leave no room for question if the item is lost or stolen.